A flock of Canadian geese wandering in a park. Now, I know a great many deal of people are not fans of Canadian geese. They're often in big flocks and get in the way. They poop everywhere and are known to be a bit aggressive. But I still like them. 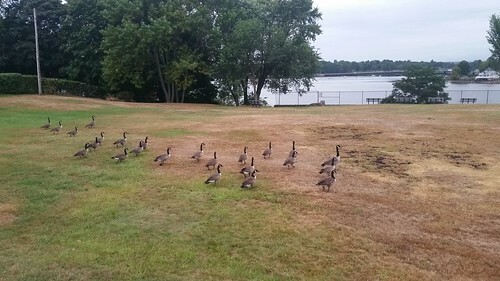 We can call it a nostalgia-infused appeal since some of my memories are feeding Canadian geese and ducks at the Mill Pond in Danvers before going to YMCA Summer Camp, decades ago, but I also marvel at their bulk and their numbers. It's one thing to see pigeons gather in a city park, searching for food or to see a flock of birds flying in the sky, but these guys largely waddle about in large groups, often in people-created spaces. I can appreciate how they merely invade and make what was once nature's and is now human's territory back into nature's territory.